Kris Meeke won the shakedown stage for Toyota. Kris Meeke and Sebastian Marshall took a major confidence boost into the start of this evening’s 16th Rally Guanajuato México by setting the fastest time of 3min 44.2sec on Thursday morning’s 5.31km shakedown stage at Llano Grande. The Ulsterman carried out three passes of the special in his Toyota Yaris WRC and finished the morning’s session just one-tenth of a second faster than second-placed Hyundai driver Andreas Mikkelsen. Belgian Thierry Neuville was third in his Hyundai i20 WRC, Dani Sordo finished fourth and World Champion Sébastien Ogier was fifth. Neuville had set the target time of 3min 58.3sec on his first pass, but that road-sweeping opener was quickly surpassed by Ogier’s flying run of 3min 51.6sec and Meeke’s 3min 51.4sec in slippery conditions. Ott Tänak emphasised the importance of the shakedown when he ground to a halt with an engine sensor issue on the first run. 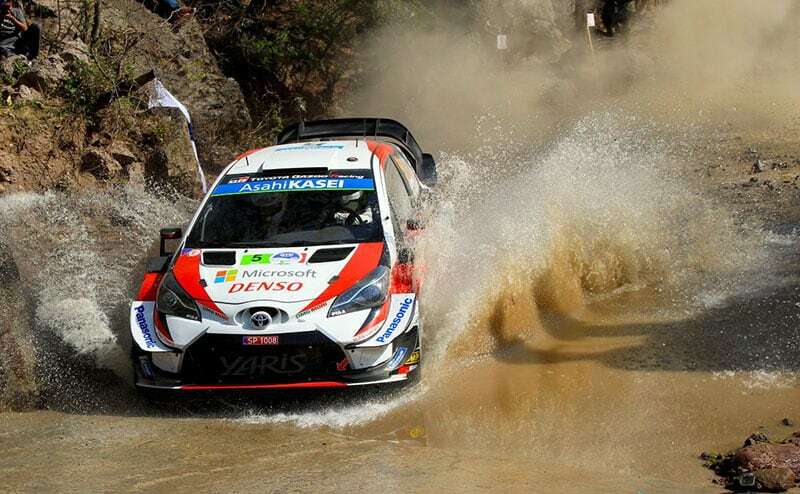 Toyota Gazoo Racing planned to retrieve the stricken Yaris WRC and head back to León, as Meeke topped the times after the first pass. Predictably, the cleaning road surface enabled drivers to clock faster second pass times and Esapekka Lappi hit the front with a 3min 47.1sec run from Mikkelsen and Ogier. Ogier hit the front on his third pass with a 3min 45.1sec, but his advantage was short lived and a 3min 44.5sec run catapulted Neuville to the top of the leader board before several crews returned to León to make set-up changes before their final runs. Mikkelsen went quickest on run four with a time of 3min 44.3sec, but his time was eclipsed by Meeke’s pass of 3min 44.2sec in the last 30 minutes of the three-hour session. Just four-tenths of a second separated the top four. Citroën faced an anxious race against time to transport essential equipment to León after falling foul of a stricken transporter ship on the route between Le Havre in France and Vera Cruz in México. The team flew 15.6 tonnes of equipment from France, including replacement recce cars for both Ogier and Lappi, with some supplies not scheduled to arrive until Friday. Colombian driver Julian Jaramillo had until 3pm on Thursday afternoon to replace a non-homologated tube in his Subaru’s roll cage after the original safety equipment had been presented at pre-event scrutineering in a damaged state. Failure to comply would mean the Impreza driver was refused a start on Thursday evening. Irishman Barry McKenna will not be starting the event in his Ford Fiesta R5.